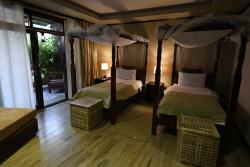 At the Five Volcanoes Boutique Hotel we aim to make your stay a pleasant and memorable one. 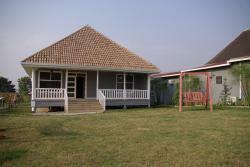 This hotel has an atmosphere unique to Musanze with beautiful gardens, outstanding service and luxury accommodation. One of our unique services is that we take care of your dirty shoes when returning from gorilla trekking (or any other activity) while you can have a shower, enjoy the pool and have a three course lunch. This is included in the rate when staying over night at the Five Volcanoes. For other guests we charge 50$ for this service. All meals included with overnight stay. 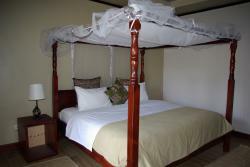 Room rates are inclusive for two guests, breakfast, three course lunch, three course dinner and taxes. 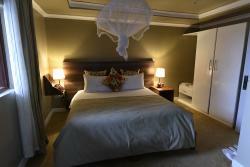 The Family suite consists of two big bedrooms, both with private bathrooms and a shared sitting room. The VIP Cottage has two big double rooms, both with private bathrooms and a living room with a dining table for six people.